Plan Ahead: Decide what part of wine country you want to visit so you can focus your tasting on a smaller area. After all, it's more fun tasting in the wineries than being stuck in traffic on Hwy 29 in Napa. Try to make any necessary appointments well in advance as a few of the more popular wineries can fill up six weeks ahead of time. Visit One or Two Appointment-Only Wineries: More than half of the wineries that welcome visitors require an advance appointment. These wineries control the number of visitors and, therefore, usually provide for a more personalized tasting experience. However, don't make more than one or two appointments on any one day as you don't want to be constantly rushing off to the next winery. Limit What You Taste: After tasting at three or four wineries, you are likely to begin to suffer from palate fatigue; where you can no longer taste the differences among the wines. Therefore, don't plan on visiting too many wineries and limit what you taste at the wineries you do visit. This will also help to ensure that you drive safely. Take Only One Winery Tour: Winery tours are interesting but, unless you are a real wine geek, one tour will suffice. Do note that some of the appointment-only wineries do not offer tastings without also taking a tour. If you would like to visit one of these wineries, make this the one winery you tour. Eat Breakfast and Lunch: Having some food in your stomach can reduce the affects of the alcohol and make for a more enjoyable day. Plus there's lots of great food in wine country. You'll definitely want to have lunch; whether it's a picnic at a winery or a gourmet lunch at one of region's fine restaurants. I hope these tips are helpful. I try to keep them in mind when I organize wine country tours for my guests. If you would like to take a private wine country tour, contact Blue Heron Custom Tours and Travel at Rick@BlueHeronTours.com or (866) 326-4237 (toll free). The new "Zagat 2011 Bay Area Restaurants" and "The Michelin Guide San Francisco, Bay Area, and Wine Country Restaurants 2011" were recently released. Here's an update on the critics' favorite restaurants in the Napa Valley. Joining the The French Laundry in Yountville as the only restaurants to receive three stars from the Michelin Guide in the entire Bay Area is The Restaurant at Meadowood in St. Helena. Thirty-nine restaurants received one star from Michelin. The Napa recipients are Etoile at Domaine Chandon, Bouchon, and Redd in Yountville; La Toque and Ubuntu in Napa city, Auberge du Soleil in Rutherford, Terra in St. Helena and Solbar in the Solage resort in Calistoga. Only 4 of the 25 most popular Bay Area restaurants, according to Zagat, are in the Napa Valley: The French Laundry, Bouchon, Ad Hoc (Yountville), and Auberge du Soleil. Other Napa Valley restaurants on the 50 most popular list are Bottega (Yountville), Bistro Jeanty (Yountville), Mustard's Grill (Yountville), Redd , and Hog Island Oyster (Napa city). The top rated restaurants for food in the Napa Valley according to Zagat are The French Laundry (29 points), La Toque (27), Redd (27), Ad Hoc (27), Auberge du Soleil (26), Terra (26), Ubuntu (26), The Restaurant at Meadowood (26), Martini House (26) (now closed), Bouchon (26), and Bottega (26). "The San Francisco Chronicle's" top rating is four stars, which were awarded to two Napa Valley restaurants: French Laundry and The Restaurant at Meadowood. The following Napa Valley restaurants received 3.5 stars: Bistro Don Giovanni (Napa city), Etoile, Redd, and Terra. Fourteen restaurants are the recipients of three stars. My favorite lunch spot in the Napa Valley remains Auberge du Soleil. The combination of food, service, and view can't be beat. I've taken many happy guests to this restaurant. If you would like to take a private tour of the Napa Valley that includes a meal at one of these great restaurants, contact Blue Heron Custom Tours and Travel at (866) 326-4237 or Rick@BlueHeronTours.com. Winetasting in Paso Robles and Touring Hearst Castle. The November issue of Blue Heron Custom Tours and Travel's free, quarterly newsletter, "Rick's Tips," has just been released. The feature articles are on winetasting in Paso Robles and touring Hearst Castle. To see the issue click here. To receive future issues of "Rick's Tips," click here. Yesterday, I had four lovers of Cabernet Sauvignon who wanted to visit the Napa Valley. One member of the group had been before and wanted to return to some of his favorite wineries. However, they wanted to taste at one more winery before returning to San Francisco, so I suggested Pine Ridge. They were not disappointed. The tasting room offers two tasting options: a Current Release Flight and a Cabernet Sauvignon Flight. The former includes whites and reds and costs $15/person. The Cabernet Flight costs $25/person and includes Cabernet-based wines. For these four Texans, there really wasn't a choice. They tasted a Napa Valley Cabernet Sauvignon, an Oakville Cab, a Stag's Leap Cab, a Bordeaux-style blend called Fortis, and two extra surprises, Epitome Cabernet, a wine that is 100% Cabernet from the Stag's Leap District, and Andrus Reserve, a Cabernet from the Andrus Vineyard. They loved all of the wines. One person preferred the Epitome, another the Andrus, and a third the Napa Valley Cabernet. (The fourth member of the group liked everything.) As the 2006 Napa Valley Cab was on sale for 50% off on purchases of six or more bottles, they bought a good supply to take home. Pine Ridge also offers an excellent winery tour a few times each day that includes a visit to the winery's cave, a barrel tasting, and tasting of current release wines. The tour costs $25/persona and requires an advance appointment. If your group is six or less, no appointment is needed to taste at Pine Ridge. If you are Cabernet fans and want to take a private tour of the Napa Valley that includes a visit to Pine Ridge, contact Blue Heron Custom Tours and Travel at (866) 326-4237 (toll free) or Rick@BlueHeronTours.com. For many years, I wanted to visit one of wine country's coopers to learn more about the process of making wine barrels. Earlier this week, I finally had the opportunity; visiting Seguin Moreau Napa. Here I learned more about the process of making barrels: from growing the oak trees, selecting the best oak, milling the wood, seasoning the wood, to assembling the barrels. 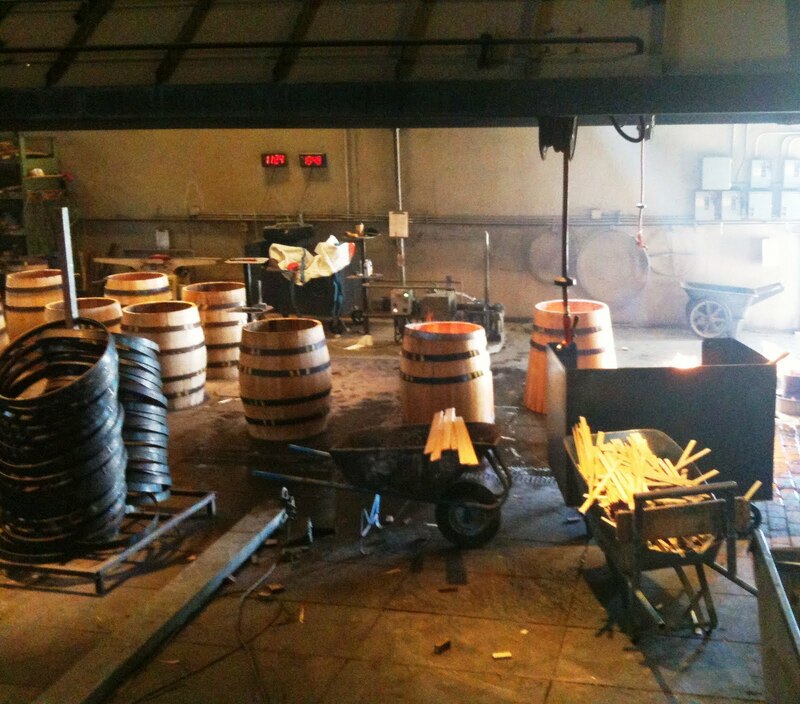 In the cooperage, I saw workers toast the barrels as well as assemble them. Seguin Moreau is one of France's premier makers of wine barrels and has been in the Napa Valley since 1994. Barrels are made from oak trees grown in France, Eastern Europe, Russian, and the United States. American oak comes from forests in Missouri and the Appalachian Mountains and is seasoned in Seguin Moreau's yard near Perryville Missouri. Unfortunately, Seguin Moreau is not open to the public so I cannot include a stop on a tour of the Napa Valley. (I also believe none of the other cooperages admit the public.) However, much information is available on the Seguin Moreau Napa website, including the video that I saw at the cooperage. 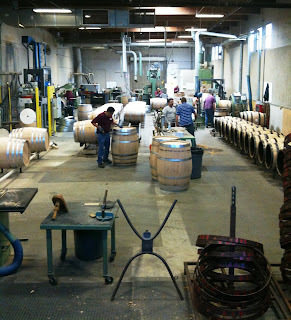 If you would like to learn more about the barrel making process during a private tour of the Napa Valley, contact Blue Heron Custom Tours and Travel at (866) 326-4237 (toll free) or Rick@BlueHeronTours.com. The August 2010 edition of "Rick's Tips," Blue Heron Custom Tour and Travel's free quarterly newsletter of fun and interesting things to do in San Francisco and the Bay Area, focuses on winetasting in the Carneros region of southern Napa and Sonoma Counties. Just click here to see the newsletter. If you're heading to the Sonoma or Napa Valley via the Golden Gate Bridge, you'll drive through the wine region known as Carneros. Just before the intersection of CA 121 and 116, you'll come to Cornerstone Gardens, a collection of beautiful gardens, shops, galleries, tasting rooms, and Sage Fine Food and Provisions. Here you can get tasty sandwiches, salads, soups, and desserts as well as a variety of wine country gift items. You can take your food to eat at one of the outdoor tables at Cornerstone, or Sage can pack the food so you can picnic at one of the nearby wineries; perhaps Cline or Nicholson Ranch. While you stop for food, don't forget to explore Cornerstone. You'll find interesting items for sale and some good wine to taste. If you want to take a private wine country tour that includes a stop at Cornerstone, contact Blue Heron Custom Tours and Travel at (866) 326-4237 (toll free) or Rick@BlueHeronTours.com. Three years ago, I wrote about the historical attractions on Sonoma Plaza -- Mission San Francisco Solano, the Bear Flag Revolt, and Sonoma State Historic Park. 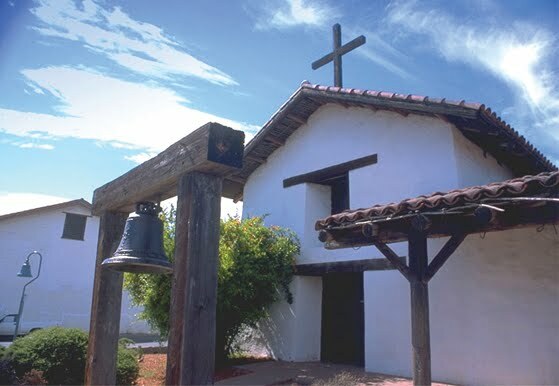 You can read further about Sonoma Plaza's history by clicking here. However, there's much more to Sonoma Plaza than history. The Plaza is one of the best places to lunch in wine country. There are a variety of restaurants, so you're bound to find a place to make you happy. Many restaurants have gardens in the back for outdoor dining on one of the many warm, sunny days. My favorite lunch spots include The Girl and the Fig for French influenced American food, Della Santina's for Italian cuisine, the Sunflower Caffe for sandwiches and salads, and El Dorado Kitchen for American food. The Plaza is also home to one of the Bay Area's few Portuguese restaurants - La Salette. I've yet to try it, so please comment below if you've dined there. If you are staying on the Plaza and want to taste wine without driving, you're in luck. There are at least 7 tasting rooms on or within walking distance of the Plaza. Want to shop? Sonoma Plaza has plenty to offer with a variety of stores. Two of my favorites are Baksheesh, which sells fair trade items from around the world, and Lisa Kristine Gallery, home to fine art photographs taken around the world. For more information on Sonoma Plaza and Sonoma Valley, visit the Sonoma Valley Visitors Bureau's website: www.sonomavalley.com. If you would like to take a private wine country tour that includes a stop on Sonoma Plaza, contact Blue Heron Custom Tours and Travel at (866) 326-4237 (toll free) or Rick@BlueHeronTours.com. In yesterday's sister blog, "Rick's San Francisco Journal," I wrote about seafood restaurants in San Francisco. Today I'll write about seafood in Napa and Sonoma Wine Country. In Sonoma County, the best seafood restaurant is Willi's Seafood and Raw Bar in Healdsburg. Willi's features small plates of seafood that are meant for sharing. Being a Baltimore native, I am very picky about crab cakes and I think that Willi's are the best in the Bay Area. My wife summered in Maine when she was a kid and always craves a good lobster roll. She thinks Willi's is as good as it gets in the Bay Area. In Napa, you'll probably want to head for Go Fish in St. Helena if you're craving for seafood. This is chef/owner Cindy Pawlcyn's third restaurant in the Napa Valley. (The others are Mustard's Grill and Cindy's Backstreet Kitchen.) The restaurant has cooked seafood, seafood-based salads, sushi, and a raw bar. If you like oysters, you can head to Hog Island Oyster Bar in the Oxbow Market in the city of Napa for some raw and cooked oysters and clams. Most restaurants in wine country have seafood dishes on their menus but if you want a restaurant that specializes in seafood your options are limited. This is the third, and last, post on winetasting near Paso Robles. If you missed the first two, the first was on the wine and the second on lodging. This post covers dining. There are limited options for dining once you are out of the towns and in wine country. Justin Winery, west of Paso Robles, is home to Deborah's Room, an upscale restaurant where you can have a gourmet dinner or a more casual lunch. We recently lunched there and enjoyed dining outside on their terrace. Lunch options include burgers, bratwurst, and salads. Dinner is much more sophisticated, consisting of a five-course, tasting menu. Dinner is served nightly and lunch is offered on Saturdays during the winter months and on Saturdays and Sundays during the summer. If you plan to eat dinner at Deborah's Room and are not staying at the Just Inn, watch your wine consumption as the drive back to Paso Robles or Cambria is along unlit, narrow country roads. Another lunch option on the west side of Paso Robles is to picnic at a winery. You can get supplies in Cambria, Paso Robles, or at Farmstand 46 at the intersection of CA 46 and Vineyard Drive. East of Paso Robles, you can lunch at Cass Cafe at Cass Winery. The menu is limited but includes a salad, sandwich, pizza, and cheese plate. The cafe is open daily from noon until 4:00 p.m. You can also picnic at many of the wineries on the east side. For dinner, Paso Robles is home to a few excellent restaurants. We've eaten at both Artisan and Bistro Laurent and enjoyed them both. Also recommended are Villa Creek and Il Cortile. If you are staying in Cambria, I recommend Black Cat Bistro. I've also heard good thing's about Madeline's Restaurant but not eaten there. There are other options in both towns but these are my recommendations. I hope this series of posts on Paso Robles is helpful. If you'd like to visit Paso Robles, Cambria, and San Simeon from San Francisco, please contact Blue Heron Custom Tours and Travel at (866) 326-4237 (toll free) or Rick@BlueHeronTours.com. When you go winetasting near Paso Robles, where to stay depends on where you want to taste and if you want to combine a visit to Paso Robles with other activities. If you want to taste wine only on the east side of Paso Robles, then you probably want to stay in the town of Paso Robles or at a bed and breakfast on the east side. If you only want to taste wine on the west side of Paso Robles, you can stay in Paso Robles, at a bed and breakfast in the countryside, or in the coast-side towns of Cambria or San Simeon. If you stay in Cambria or San Simeon, you can also easily visit the Hearst Castle at San Simeon and enjoy the beaches at both towns. If your sole mission is to taste wine and you plan to visit wineries both east and west of Paso Robles, then you probably want to stay in Paso Robles or at a bed and breakfast that's in the countryside but not too far away. Paso Robles has an array of hotel options but my preference would be to stay near the main square. If you are near the square you can easily walk to one of the city's good restaurants (more on this in my next post), tasting rooms, and wine bars. If you decide to make the plaza your home for your Paso Robles vacation, you have two options: Hotel Cheval and Paso Robles Inn. The former is an upscale boutique hotel, while the latter is a much larger and less expensive hotel that is a member of Historic Hotels of America. You'll do fine at either. Your decision depends on your budget and the type of experience you want to have. If you decide to stay on the coast, you have three areas to choose from. In San Simeon, there are motels lining CA Route 1, a few miles south of the Hearst Castle. The motels on the ocean side generally cost more than those on the inland side, particularly if you have an ocean view. In Cambria, you can either stay at a motel/bed and breakfast on Moonstone Beach or at a bed and breakfast in town. Some of the establishments along Moonstone Beach call themselves bed and breakfasts but are really motels that serve breakfast. The motels along Moonstone Beach sit across a small road from the beach, while those in San Simeon are on a low bluff overlooking the beach. You can also stay in the town of Cambria where there are a few bed and breakfasts. You'll be closer to the town's shops and restaurants but will sacrifice an ocean view or an easy walk along the Pacific. For more detailed lodging information visit the websites of the Paso Robles Wine Alliance, Paso Robles Chamber of Commerce, Cambria Chamber of Commerce, or San Simeon Chamber of Commerce. If you would like to take a private tour of Paso Robles wine country, San Simeon, and/or Cambria that starts in San Francisco, contact Blue Heron Custom Tours and Travel at (866) 326-4237 (toll free) or Rick@BlueHeronTours.com. This past weekend, I finally had a chance to do some winetasting near Paso Robles, about 3.5 - 4 hours south of San Francisco. This wine region is growing by leaps and bounds with over 150 wineries located in the area. While there is just one wine region - Paso Robles - the climate is much warmer and drier east of town than on the west side. More wineries are located west of the city of Paso Robles and that's where we spent our day tasting. Wine grapes have been grown in the area for decades but, until recently, the area was best known for less expensive, bulk wines. About a decade ago, the Zinfandels produced in Paso Robles started getting noticed. More recently, some excellent wines from Rhone varietals, such as Syrah, Petite Syrah (Durif), Mourvedre, Roussanne, Marsanne, and Viognier, have been produced. We started tasting at two fairly well known producers - Justin Vineyards and Winery and Tablas Creek Vineyards. Justin is one of the larger producers of premium wine in Paso Robles, making around 60,000 cases per year, and is best known for Cabernet. You can taste wine while lunching at Deborah's Room, which we did, or in the winery's tasting room. Tablas Creek produces some excellent Rhone style wines. The tasting room, like all of the rooms we visited, was small. The staff was friendly and attentive, even though they were stretched thin on a busy Saturday afternoon. Local folks turned us on to two small producers that I was not familiar with: Jada Vineyard and Winery and Halter Ranch Vineyard. Both produced very good wines from Rhone varietals. At both wineries staff was very friendly and answered our many questions. Jada offers cheeses paired with their wines. We also tasted some wines which weren't very good and visited one winery -- Denner Vineyards -- where the staff was more interested in cleaning glasses and chatting with each other than talking with us. I definitely recommend doing some winetasting in Paso Robles, particularly if you like Zinfandel and/or Rhone wines. Tasting fees are reasonable -- usually no more than $10 or $15/person -- and staff friendly. The tasting rooms are small and can be crowded on Saturdays so you might want to try to visit on another day. If you would like to take a private tour from San Francisco that includes winetasting in Paso Robles, contact Blue Heron Custom Tours and Travel at (866) 326-4237 (toll free) or Rick@BlueHeronTours.com. For more information on winetasting in Paso Robles, visit the Paso Robles Wine Alliance's excellent website: www.PasoWine.com. In my next post, I'll cover dining and lodging options in and near Paso Robles. I last wrote about getting your wine home from wine country in 2006. Since that time, more states have changed their laws and permit wineries and businesses to directly ship wine to consumers. Nevertheless, there are still states that make it difficult for their residents to get wines directly from the winery. One of the best lists can be found on the Wine Institute's website. For those of you living in the states that make it difficult for wineries to ship your wine home, there are ways. The cheapest and fastest way to get your wine home is to buy a shipping container (usually made of Styrofoam or egg-carton material) from a winery or a shipping company and then check the box as luggage. The boxes are durable and breakage is extremely rare. The cost is $10 for the box, which comes in a variety of sizes, plus the 2nd bag fee of your airline. The total is usually less than $40; cheaper than the $45 - $90/case for shipping wine. Plus you have your wine with you and don't need to worry about it traveling through hot or freezing weather. If you prefer to send your wine home, there are shippers in both Napa and Sonoma Counties that can help you. I have found that at least one shipper ships to every state. So, if you live in a really restrictive state, such as Utah, Pennsylvania, or Massachusetts, be sure to call the shipper before taking your wine there. If the first shipper can't help you, try another. In the Napa Valley, I have had guests ship wine from Buffalo's Shipping Post and Stagecoach Express in the city of Napa and St. Helena Shipping Company in the northern end of the Valley. If you are in the Alexander, Dry Creek, or Russian River Valley, you can visit Fitch Mountain Packaging, (707) 433-1247, or the UPS Store in Healdsburg. If you are visiting Sonoma Valley, try Sonoma Shipping or the UPS Store in the town of Sonoma. Before heading to any of these places, call to make sure they ship to your state and to check their hours. Only Buffalo's is open on Sundays and some have limited hours on Saturdays. Some of these shippers will pick up your wine directly from the winery or your hotel. Once you establish a relationship with a shipper, you can order wine from a winery, have the winery hold it for the shipper to pick up, and then have the shipper get your wine and send it to you. Even if you are not visiting wine country but want to get wine from a winery that cannot ship to your state, contact one of the shippers to see if they can help you. Be sure to send your wine to an address where someone age 21 or over will be there to sign for the package. UPS and FedEx cannot just leave the wine or have you sign a slip and leave it for them. An adult must be physically present at the time of delivery. Shipping rates are sometimes cheaper if you send your wine to a business address. Hopefully, more states will make it easier for consumers to get wines directly from the wineries. If you reside in a restrictive state and are interested in "freeing the grapes," contact the Wine Institute and your state legislators. A popular lunch spot in St. Helena is Taylor's Automated Refresher. This is not your typical, fast-food, hamburger and fries joint. High quality beef is used; the fries are fresh, and there's even a wine list. And, as of today, it has a new name Gott's Roadside "Tray Gourmet." There's more than burgers and fries at Gott's Roadside. You can also find shakes made with real ice cream, ahi tuna burgers, fresh salads, fish tacos, and monthly specials. Gott's is a great place to lunch on a sunny day as all of the tables are outdoors. However, during the summer and early fall, the wait to order can be as long as 30 minutes. Branches are also located in Oxbow Public Market in Napa and the Ferry Building in San Francisco. If you would like to take a private tour of the Napa Valley that includes lunch at Gott's Roadside, contact Blue Heron Custom Tours and Travel at (866) 326-4237 (toll free) or Rick@BlueHeronTours.com. If you want to spend your entire day tasting in the Russian River Valley, there are few options for lunch without heading to the towns of Santa Rosa, Healdsburg, or Sebastopol. However, in the heart of the Russian River Valley sits the small town of Graton. Here you can lunch at Willow Wood Market or Underwood Bar and Bistro. The similarly named restaurants have the same owners but the food and ambience are different. Willow Wood, which is my favorite, serves a variety of salads, hot sandwiches, and polentas. At one time, the restaurant was a small part of a larger market, but today the restaurant and carry-out bar occupy the entire space. You can also dine outside in the small garden behind the restaurant. Willow Wood is open for lunch from 11:30 - 5:00, Monday - Saturday. Brunch is served on Sunday from 11:00 - 3:00. Underwood is larger with bar in the front. The lunch menu consists of tapas and small plates. Lunch is served between 11:30 and 2:30, Tuesday - Sunday. A similar menu is offered at the bar from 2:30 - 5:00. If you are a Pinot Noir or Chardonnay fan, you'll definitely want to spend some time in the Russian River Valley. Stop in Graton for lunch and you won't be disappointed. If you would like to include a private tour of the Russian River Valley, contact Blue Heron Custom Tours and Travel at (866) 326-4237 (toll free) or Rick@BlueHeronTours.com. The Dry Creek Valley in Northern Sonoma County is best known for Zinfandel and many wineries produce at least one wine from this grape. However, one winery -- Michel Schlumberger -- has gone down a different path. The winery built its reputation on Bordeaux varietals such as Cabernet Sauvignon, Merlot, and Cabernet Franc. No Zinfandel was to be found. Today the winery has expanded its offerings to include Chardonnay, Pinot Noir, Malbec, Syrah, and Pinot Blanc. But still no Zinfandel. If you're heading to the Dry Creek Valley and want to taste some Bordeaux style wines in pleasant surroundings be sure to head to Michel-Schlumberger but make an appointment first. The winery offers tours and tastings daily at 11:00 a.m. and 2:00 p.m. For $15/person, you'll get to walk through their lovely vineyards, gardens, and winery. You'll see how their wines are made and then will be able to taste their current releases either in the winery's gourmet kitchen, living room, or courtyard. Other touring and tasting options are available so check out the winery's website for options. Better yet, take a private tour of the Dry Creek Valley that includes a visit to Michel-Sclumberger. For more information contact Blue Heron Custom Tours and Travel at (866) 326-4237 (toll free) or at Rick@BlueHeronTours.com. I've been commenting on tasting rooms for over 4 years now and thought I should provide a little background on how I come to talk about a particular winery or tasting room. First, I only comment on tasting rooms or wineries that I have personally visited. Half of the wineries in Napa and Sonoma are not open to the public. Of those that welcome visitors either by advance appointment or by dropping in, I have visited about 125 of Sonoma's 270 wineries and tasting rooms and 145 of Napa's 335 wineries and tasting rooms. The vast majority of those I have yet to get to require an appointment to visit. Second, I operate under the assumption that the wine is good at nearly all of the tasting rooms in Napa, Sonoma, and Mendocino Counties. Not every winery has wine that is going to be to your or my taste but the wines are generally good. There are many people far more qualified than me who review wines. Besides visiting wine country to taste wine is more about the experience than the quality of the wine. Third, I generally only post positive reviews. I want to give my readers information on wineries and tasting rooms to seek out. Most tasting rooms are neither good nor bad; they're much like every other tasting room. However some tasting rooms are special and are worth visiting. Many factors contribute to a positive review including friendly tasting room staff, unique architecture, good value, an opportunity to meet the owner and/or winemaker, pretty scenery, an unusual tasting experience, and/or an interesting tour. On the rare occasion when I say something negative about a winery or tasting room, it's because I think the visitor is not getting a quality experience. Fourth, I do not get compensated for my reviews. Many guests on my tours ask if the wineries give me anything to thank me for bringing visitors to their tasting rooms. At the end of the year, a couple wineries may give me a bottle or two, but that's it. I've never received anything for a positive review other than an e-mail thanking me. I hope this background is helpful. Let me know what you think. When you drop in to taste at a winery, you usually stand up at the counter. Wineries do this to help with turnover and for space considerations. It's rare to find a winery, that doesn't require an an appointment, where you can sit down and relax with your wine. But there are some! In Napa, the three French-owned sparkling wine producers all have tables where you can sit with your wine. My favorite is Domaine Carneros, which has servers who take your order and then bring your wines, cheese, and/or caviar to you. The view of the rolling vineyards from Domaine Carneros' terrace is beautiful. Mumm Napa Valley is also very nice. It too has servers and a lovely view from the patio. However, Mumm does not offer any food. Domaine Chandon is my least favorite of the three While it has tables in its tasting room and offers some food, it does not have servers. When you want to get your next glass of wine, you must get up and return to the tasting bar. Plus the view from the patio is not as nice as the views at Domaine Carneros or Mumm Napa Valley. Frog's Leap in Rutherford offers a tasting of four wines, accompanied by some cheese, nuts, and dried fruit on the terrace overlooking its organic gardens and vineyards. This is one of the more pleasant spots to sit and taste wine. Robert Mondavi Winery in Oakville has a large table in the To Kalon Room, where you can sit while you taste Mondavi's reserve wines. On a cold day, it's nice to taste your wine by the fireplace. In the Russian River Valley in Sonoma County, Lynmar Winery has tables in the tasting room, on the patio, and next to the garden. You order at the counter, but the friendly staff will bring your Chardonnay, Pinot Noir, and/or Syrah to your table. There may be other wineries where you can sit down while you enjoy your wine, but either I am forgetting them or have not yet visited the tasting rooms. If you know of any, please comment below. Yesterday, the Sonoma County Tourism Bureau released an application (app.) for the IPhone to help visitors to the county. As soon as I found out this morning, I immediately downloaded it. The coolest feature is the wine section where you can search the wineries by varietal (type of grape). So next time you are in Kenwood in search of a Barbera, you can use the app. to find out which wineries produce one, their distances from your current location, and how to drive to each one. For me this is the best feature in the app. The app. also lets you find lodging, sorted by "Hotel/Motel/Lodge," "Inn/Bed & Breakfast," "RV/Camping,", and "Vacation Rentals." This too is a helpful feature but the listing is not complete for the county. I assume this is because some businesses choose not to be a member of the Bureau. Other features include Breweries, spas, restaurants, museums, events, nightlife, and spas. These you can sort alphabetically or by distance from your current location. A great improvement for the next release would be to be able to sort the restaurants by cuisine. To find the app., visit the IPhone Applications Store and select iVisit Sonoma County. All in all, this is a great app. for wine lovers. The tourism folks in Sonoma County really do a terrific job, whether they work for the Tourism Bureau, the Wine Road Northern Sonoma County, or the Sonoma Valley Visitors Bureau. Their neighbors to the east could learn something! If you want to take a private tour of Sonoma County wine country, please contact Blue Heron Custom Tours at (866) 326-4237 or Rick@BlueHeronTours.com. Yountville, in the Napa Valley, must be the best easting small town in the United States. With just over 3,000 residents, Yountville is home to one restaurant that has received three stars from the Michelin guide and three that have received one star. To receive one star is an honor. Three stars is as good as it gets in fine dining. The three-star restaurant is Thomas Keller's French Laundry. Keller also owns Bouchon, which has received one star. The other one-star restaurants are Redd and Etoile at Domaine Chandon, the only winery in the Napa Valley to have a restaurant. Also in town are Bistro Jeanty for fine French cuisine Bardessono for California food, and Bottega for Italian cuisine. More casual places include Pacific Blue, Hurley's, and Cantinetta Piero. Just north of Yountville are Mustard's Grill and Brix. The former serves excellent American food and the latter is known for its California cuisine. If this isn't enough, you can get excellent pastries at Bouchon Bakery, paninis at.Napa Style, and coffee at the Coffee Caboose. Lastly, Yountville has a bunch of tasting rooms within a short walk of each other. They include Hill Family, Hope and Grace, Girard, Jessup, and Ma(i)sonry Napa Valley. Having all of this food and wine at hand, makes Yountville the perfect place to base your Napa Valley vacation. Staying in Yountville means you can have an excellent dinner and not worry about drinking too much wine as you can just walk back to your hotel, inn, or bed and breakfast.